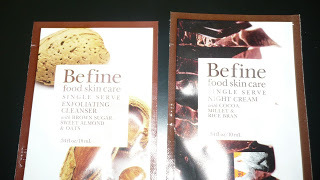 Befine food skin care products are listed as Paraben, Allergen and Fragrance free. “Prepared from ingredients sourced from plants or minerals. Be fine products offer skin what the body innately knows: You are what you eat”. Pore Refining Treatment Scrub with Coconut, Jojoba, & Citrus on the left. After using this product I noticed my skin felt firmer and smoother. 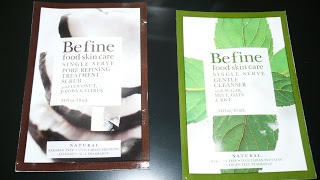 Befine Gentle Cleanser with Sugar, Oats, Mint & Rice on the right. This product cleans, conditions and moisturizes your skin all at once. The addition of the mint in this product gave my skin a “cooling effect” the mint really gets the circulation going. Befine Night Cream with Cocoa, Millet & Rice Bran on the right. This cream although a little thick was immediately absorbed, my skin just gobbled this one up. Normally, night creams “sting” my skin but not this one. Befine Exfoliating Cleanser with Brown Sugar, Sweer Almond & Oats on the left. Although this product was grainy, it was not coarse or abrasive. It is sticky from the brown sugar, but it rinses off easily. My skin felt really good after, I will be using this one again. Over all I found the products quite good and I did not have a reaction to any of them (I have very sensitive skin). On their site you have the option of purchasing single serve packs of the products, which is what I did because I was not sure if (a)I was going to like them or if (b)I would have an allergic reaction to them. Their website also has a recipe section which initially I thought how strange, but the products are food based and they state, the same foods that we eat are also good for our skin. So each recipe featured on the site has a link to the product that uses it. For example, they have a Minty Beet and Greens Salad recipe, with a link to their Lip Serum which contains beet. You should check out their VLOGS as well. The one I found interesting was an interview with the Founder, which states how the idea and products came about.